"Boys. Why don't boys ever listen." The damsel in distress trope is rapidly becoming less of such a trope these days. There are plenty of strong, female characters--many of whom aren't shy about their ability to defend themselves. 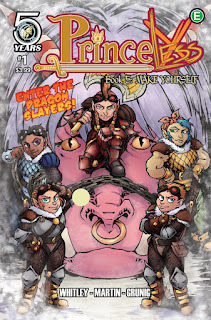 Adrienne from the Princeless series is one such character and her latest installment Princeless Book 5: Make Yourself #1 is out from Action Lab Entertainment. The issue is written by Jeremy Whitley, illustrated by Emily Martin and colored/lettered by Brett Grunig. Whitley decided to open up Princeless Book 5: Make Yourself #1 by focusing on Adrienne's twin brother who's trying to get home. Throwing Kira the werewolf into the mix to help him is interesting and things get even more interesting when Whitley mixes in a rival prince on a similar quest. Princeless has primarily been about the princesses of the kingdom so Whitley mixing those princes in for a more predominant role is effective at cleaning things up a bit in terms of plot. Adrienne and Bedelia definitely get their time to shine as well in a scenario that also gives Spark the dragon a new opponent to contend with in terms of the Dragonslayers. There are two primary plot lines that are flowing throughout the issue and Whitley's pacing gives each plenty of room to breathe. Probably more than any other Princeless, the art style in Princeless Book 5: Make Yourself #1 feels the most fantastical. Martin gets a lot of room to play around with dwarves and their mountain abode, rendering a setting there that's rife with dark chambers and plenty of rocky environs. It's a pretty stark contrast to the scenes with the princes as Martin presents those scenes as much more open (and less claustrophobic) but with decidedly less detail. Generally speaking though, the characters maintain enough individual characteristics that they're easily distinguishable from one another as Martin relies on bold lines to characterize each one. Grunig's colors are a good fit for the book with the disparate groups sporting a variety of hues that range from bright pinks to darker browns. 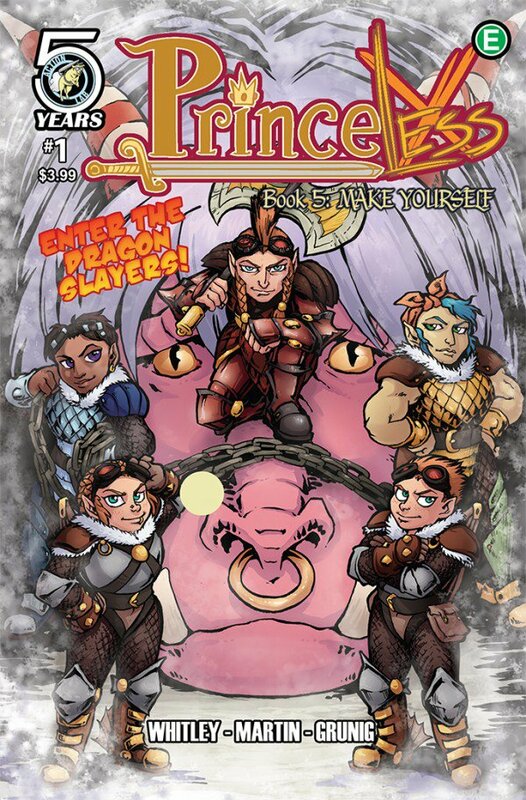 Princeless Book 5: Make Yourself #1 is in stores now.